The first hands-free friction call on the market! Designed by Travis "T-Bone" Turner, the Knight & Hale Turkey Magnet Box Call is one of the most innovative turkey calls on the market today. It attaches quickly to your shotgun and keeps the calling lever within easy reach, allowing you to produce realistic tones without taking either hand off your shotgun. Great for yelps, clucks, purrs and more. 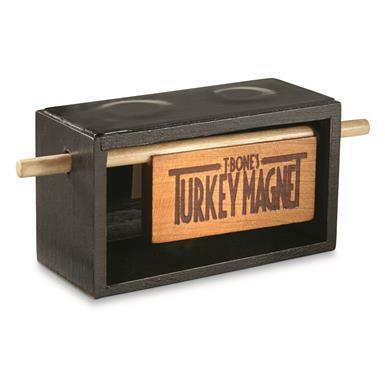 Knight Hale Turkey Magnet Box Call is rated 3.0 out of 5 by 2. Rated 1 out of 5 by Ronald from no magnets included. tone not as good as other calls I have. Rated 5 out of 5 by Jimmy from Very good price!! Good quality!! Haven’t taken it to the woods, but can’t wait !! I’ve got several types baby t this one is very user friendly!!! Any more realistic, and they'd have a heartbeat. Off-road travels without the clutter. Measures 38" x 27.5" x 16.25"h.
Comfort and convenience…with added security. Get the best of those stubborn spring gobblers.